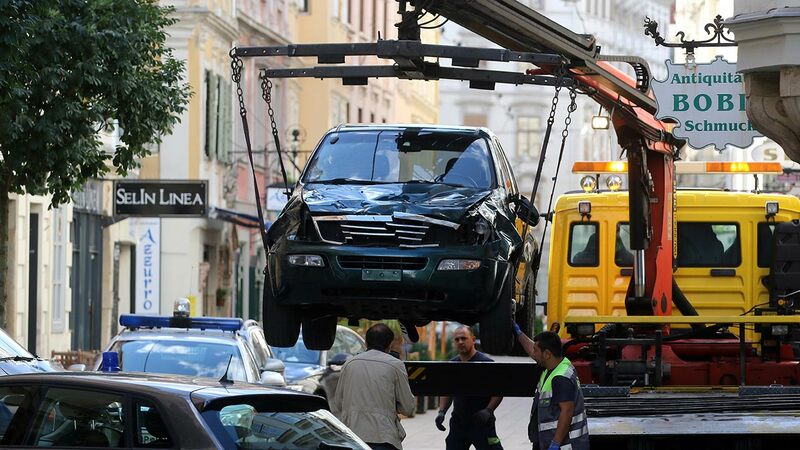 VIENNA, Austria -- A man apparently distraught over personal issues drove his SUV into a crowd in Austria's second largest city Saturday, killing a 4-year old and two adults, officials said. Police in the city of Graz said 34 others were injured, with six victims, including two children, in serious condition. They said there were no indications of a terrorist attack, and the suspect was apparently distressed over personal problems when he targeted his victims. The governor of Styria province, Hermann Schuetzenhoefer, described the suspect as a 26-year-old Austrian truck driver who was "mentally disoriented" and acting alone. He was arrested shortly after the incident. Police commander Josef Klamminger told reporters that the man had been under a restraining order keeping him from the home of his wife and two children since a domestic violence report against him was filed last month. He was being psychologically evaluated after his arrest. State broadcaster ORF cited unnamed witnesses as saying the man apparently drove his vehicle at high speed into the crowd at random, sending several people crashing into the windshield and flying over the vehicle. About 60 ambulances converged on the scene and the Austrian auto club sent four helicopters to bring the victims to hospitals. Witnesses quoted by Austrian media said they saw at least two bodies covered with blankets lying on a cordoned-off section of pavement. By early evening, dozens of floral bouquets and lit candles were placed at the site. Mayor Siegfried Nagl ordered black flags of mourning flown from all municipal buildings and cancelled all street fests and other city events.